The Heritage collection from Longines features superb watches in a historical style. These timepieces range from pilot's and diving watches, to chronographs and dress watches. The designs are largely inspired by watches from decades past. The Heritage collection by Longines pays homage to beloved watches produced by the Swiss manufacturer throughout the 20th century. It includes watches with legacies dating back to 1918. Several model names in the series feature corresponding dates that point to their historic roots. Lovers of classic, elegant timepieces, as well as fans of technically-oriented watches will find something in this series to make their hearts beat a little faster. One of Longines most notable timepieces is part of this series: The so-called Hour Angle Watch , which dates back to the time of Charles Lindbergh. Following the development of the transatlantic aircraft, Longines created a watch to be used for navigation. It was first released in 1931 and remains very true to the original to this day. The Lindbergh Hour Angle Watch has an impressive stainless steel case measuring 47.5 mm in diameter. The current version of this model can be found under reference number L2.678.4.11.0 for around 3,500 euros. A gold anniversary edition was released in 1987 to commemorate Lindbergh's flight 60 years before. It costs around 10,000 euros (reference number 44627.1). The Heritage Column Wheel Chronograph offers a timing function with three subdials in a tri-compax layout. This watch boasts a sporty elegant look with dauphine hands inspired by watch designs from the 1950s. A 39 mm Column Wheel Chronograph in rose gold with a crocodile leather strap (reference number L2.742.8.76.2) costs around 6,500 euros. The stainless steel version costs around 2,000 euros. The Conquest Heritage isn't too far from the Column Wheel Chronograph in terms of style. Most varieties are streamlined three-hand watches with dauphine hands and a date display. 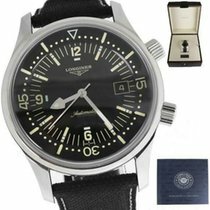 However, there are also a few Longines Conquest Chronographs on the market. A sleek, gold watch will cost you around 3,500 euros. The version with a 40 mm stainless steel case, black dial, and rose gold hands (reference number L1.645.4.52.4) costs around 1,500 euros. Are you looking for a men's watch for slimmer wrists? 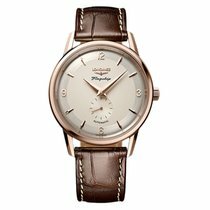 You can purchase a 35 mm Conquest with a silver dial and gold-colored hands (L1.611.4.75.2) for around 900 euros. The Heritage Avigation line features classic pilots' watches. One particularly attractive timepiece is the A7 1935, which has a dial that is slightly rotated to the right (L2.812.4.23.2). The 40-degree rotation was designed to help pilots read the watch without letting go of the aircraft's control stick. A new, 41 mm A7 1935 is available for around 2,500 euros. If you're interested in a larger pilot's watch with a second time zone and a more conventional, modern design, take a look at reference number L2.831.4.53.2. This stainless steel Avigation GMT has a diameter of 44 mm and costs around 1,400 euros. Some timepieces in the Avigation line stand out due to their oversized crowns. The Oversize Crown models harken back to the start of aviation when pilots wore thick flying gloves in the cockpit. If they left their gloves on, setting a watch or starting a chronograph was only possible with larger crowns. The Oversize Crown versions cost around 2,000 euros. The Heritage Military (L2.811.4.53.0) looks very similar to a pilot's watch. Its notable features include a black dial, large luminous Arabic numerals, a small seconds display and a date display at six o'clock. The readability and large diameter of 44 mm are evidence of the Heritage Military line's close relationship to pilot's watches. You can purchase a Heritage Military for around 1,400 euros. You can also find diving watches in the Heritage collection, including the Diver 1967. This watch is waterproof up to a pressure of 30 bar, which is roughly equivalent to a depth of 300 m. It's hard to miss the red, rotatable bezel that adorns the exterior of the watch. The Diver 1967 (reference number L2.808.4.52.6) has a chronograph movement and a 42 mm stainless steel case. A new watch costs around 2,200 euros. A more affordable option is the Legend Diver, a sleek retro diving watch with a black dial. Instead of a rotatable bezel, it features an inner rotating ring to measure and display diving time. The second crown operates the inner ring. The Legend Diver (L3.674.4.50.0) is likewise waterproof up to 300 m (30 bar). 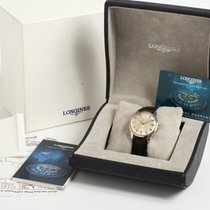 While this timepiece is no longer part of the current Longines collection, you can still purchase new pieces for around 1,600 euros. The Heritage 1918 evokes the spirit of the very first Longines wristwatches; the date in the name speaks for itself. Longines released the current line in 2016. The Heritage 1918 stands out thanks to the two looped lugs on its case, which serve as fastening points for the light brown leather strap. Ocher-colored Arabic numerals are set against a white dial, offering a nostalgic look. A small seconds display and date display are located at the six o'clock position. The Heritage 1918 (L2.809.4.23.2) has a 41-mm stainless steel case and costs around 1,500 euros new. The Heritage collection features mechanical movements from Longines, built on base calibers provided by ETA SA Manufacture Horlogère Suisse (ETA). The L699 caliber, which is found in the Lindbergh Hour Angle Watch, is thus a modified ETA A07.111. The L688, which was introduced in 2010 for the Column Wheel Chronograph, is based on the ETA A08 L01, which also serves as the base movement for the Omega 3330 caliber. 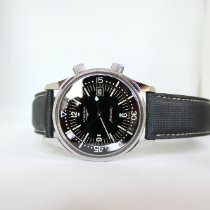 The L688 serves in several different Longines timepieces, including the Hydro Conquest chronograph diving watch. The diversity of watch manufacturers that collaborate with ETA is made possible by the Swatch Group. The last in-house Longines caliber produced was the L989.2 automatic movement from the 1980s-era Lindbergh watches. This marked the end of a long tradition, as Longines has been around since 1832, and for more than 150 years served as an independent manufacturer which distinguished itself in the field of timekeeping.